Paper Monument Project #004: In September 1960, the New Orleans chapter of the Congress of Racial Equality, or CORE, staged two high-profile sit-ins in an attempt to desegregate Canal Street lunch counters. In September 1960, the New Orleans chapter of the Congress of Racial Equality, or CORE, staged two high-profile sit-ins in an attempt to desegregate Canal Street lunch counters. Integration had slowed to a standstill. “We were fed up,” said Rudy Lombard, a New Orleans CORE leader who was then a senior at Xavier University. Their tactic, pioneered four North Carolina A&T students in Greensboro, North Carolina on February 1, 1960, was simple. For each sit-in, a group of White and Black CORE members sat together at a “whites-only” lunch counter. On September 9, 1960, at F.W. Woolworth on the corner of Canal and Rampart, five Black and two White CORE protestors were arrested after a five-hour sit-in. On September 17, 1960, CORE tried again at the McCrory’s five-and-dime store nearby at 1005 Canal. Lanny Goldfinch, a White Tulane student, walked into the store with Lombard and two other Black students, Cecil Carter Jr. of Dillard and Oretha Castle Haley, enrolled at Southern University at New Orleans. The group sat quietly, refusing to leave until they were arrested. The McCrory’s group, called the ‘CORE Four’, became well-known nationally because they were convicted of “criminal anarchy” in a case that went all the way to the U.S. Supreme Court. The New Orleans CORE chapter was a small group but “courageous to the bone,” Lombard said. Lombard believes that courage was rooted in history. 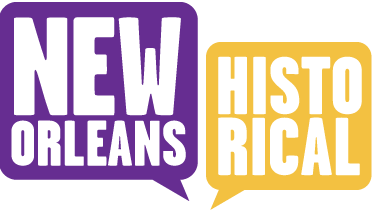 People in the New Orleans group had “a certain confidence because they came out of a culture that was so rich: they knew that everything that was unique in the city could be traced to the Black presence [here]." Though New Orleans had no segregation ordinances, Mayor Chep Morrison - who said the sit-ins ‘would not be tolerated’ -set the tone from City Hall, a factor in the Supreme Court’s ruling in favor of the CORE Four. 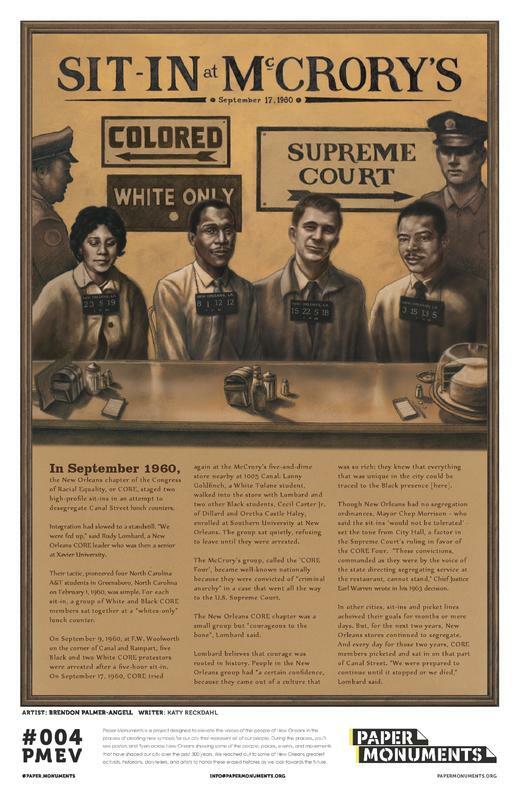 “These convictions, commanded as they were by the voice of the state directing segregating service at the restaurant, cannot stand,” Chief Justice Earl Warren wrote in his 1963 decision. In other cities, sit-ins and picket lines achieved their goals for months or mere days. But, for the next two years, New Orleans stores continued to segregate. And every day for those two years, CORE members picketed and sat in on that part of Canal Street. “We were prepared to continue until it stopped or we died,” Lombard said. Paper Monuments, Katy Reckdahl, Narrative, and Brendon Palmer-Angell, Artist, “Sit-In at McCrory's,” New Orleans Historical, accessed April 19, 2019, https://neworleanshistorical.org/items/show/1399.